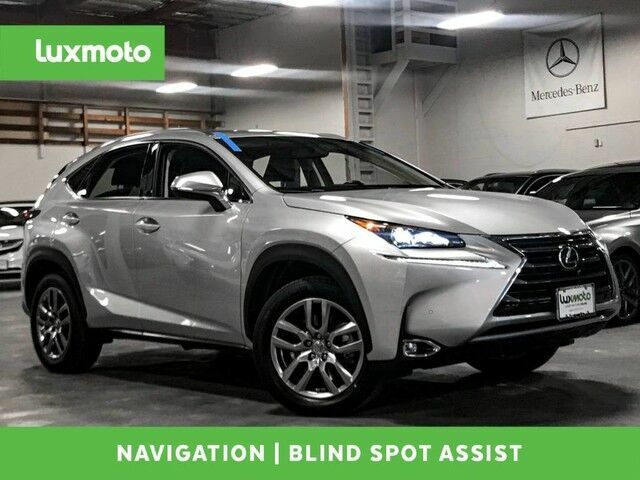 **Carfax Certified 1-OWNER**, **CLEAN CARFAX**, **FACTORY WARRANTY**, Lexus NX 200t Premium, **AWD ALL WHEEL DRIVE**, **NAVIGATION**, **BACK UP CAMERA**, **BLIND SPOT MONITOR**, **HEATED/COOLED SEATS**, **HEATED STEERING WHEEL**, **ENHANCED BLUETOOTH**, **SMARTPHON INTEGRATION**, **SATELLITE RADIO**, **MUSIC STREAMING**, **USB & AUX PORTS**, **MOON ROOF**, Power Rear Lift Gate, Heated Mirrors, Lexus Premium Audio System with 5.1 Surround Sound, AM/FM/SirrusXM/CD/DVD Stereo, Front and Rear Parking Sensors, Power Front Seats with Lumbar & Driver Memory, Tilt/Telescoping Steering Column, Cross Traffic Alert, Proximity Key For Doors And Push Button Start, HDD Navigation System w/Advanced Voice Command, Lexus Enform Safety Connect, Rain Sensing Wipers, Dual-Zone Climate Control, Xenon HID Automatic Headlights, LED Daytime Running Lights, Fog Lamps and much more. Come check out this Fabulous NX in our Indoor Showroom. The Lexus NX enters into the growing compact SUV market, but offers a bit more luxury and a lot more style than any of its competitors. The Lexus NX also stands out with its available hybrid powertrain, making this the sixth hybrid Lexus in their lineup. With a short wheelbase, ideal for city driving, the Lexus NX is easy to park and maneuver. However with decent ground clearance it has no trouble negotiating bumpy country lanes or dealing with light off-road duty during picnic trips. For drivers who want a little extra dose of excitement, the NX is available in F-sport guise. With unique styling features and sportier demeanor, the F-Sport looks meaner and even more serious than the standard NX. Prices for the NX start at under $35,000. This model sets itself apart with powerful but efficient engine choices, available all-wheel drive, practical interior, Compact dimensions, sporty styling, and available hybrid powertrain.